We’d love your help. Let us know what’s wrong with this preview of Healing the Sick by T.L. Osborn. 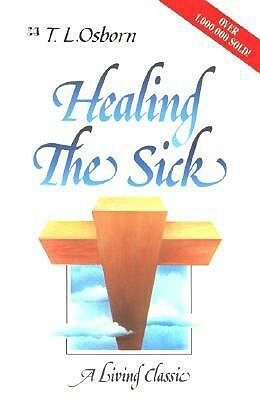 Healing The Sick - A Living Classic! This is a powerful book, so powerfu Healing The Sick - A Living Classic! To ask other readers questions about Healing the Sick, please sign up. how is the story ? I was given a paperback copy of this classic in Bible college for my Divine Healing class. Though lengthy, I finished it, along with many highlights and markings in a matter of days. I could not put it down. It lit a fire in me to see more miracles and healings in my life and ministry. I've since moved to the mission field and could not bring all the books I own with me, but this was one of the handful I brought with me. I'm so glad it's available for the Kindle now and can bless more people thro I was given a paperback copy of this classic in Bible college for my Divine Healing class. Though lengthy, I finished it, along with many highlights and markings in a matter of days. I could not put it down. It lit a fire in me to see more miracles and healings in my life and ministry. I've since moved to the mission field and could not bring all the books I own with me, but this was one of the handful I brought with me. I'm so glad it's available for the Kindle now and can bless more people through that reading channel. I've re-read many of the chapters more than once over the years. For the price of a typical Kindle book, this one is more than worth the purchase as far as the length of the content is concerned. As for the quality of the content, if you put into practice what you learn from the book, it will have been way more than worth the purchase. Going to get several copies and give them to friend's and family! This is as good book to read about healing, healing scriptures, and testimonies of how God has healed many people all over the world of blindness, deafness, and many other infirmities. This book builds your faith in God who is who we go to for healing. One of the best (if not the best) books on how to experience the power of God. It's written in a relevant way, practical and balanced. Filled with strong arguments and moving testimonies. If I had to recommend one book beside the Bible, it would definitely be this one! this will change your way of reading the bible --- God's word is living and powerful. Solid Woord - building faith - love this book. The Good News is even better than you think. God. Faith. More than just words. TL Osborn explains in this book what God promises in His book, the Bible. The question is do we have the faith to appropriate what God offers. And the gift of healing might just be one of God's greatest benefits because we can show the love and power of God by sharing our care for humanity and the desire for healing of the hurting in both a spiritual and physical and mental way. This is a must read for every Christian, especially if they are dealing with illness or sickness. I give it five stars and it has changed the way I look at healing. So thankful for this book. Written in a way that is easy to understand, backed up with scriptures. There is a section in the back with testimonies of healings all over the world and some pictures in the middle of T.L. and his wife. Great read. Don't rush through it but take your time and let it sink in. One of my top 10. A must read. So much gold in here. Sometimes we as humans have the ability to limit God and his miracles. This book will open your eyes to the wonderful mystery of the Miracle of Healing. It will help you better grasp the wonders God has in store for us. Exceptional! This is a must read for everyone wanting to know about healing. This book dispels lots of horrible doctrine that has crept into the Church over the years about healing like: does God heal everyone? Does God want people well? Undoubtedly the greatest book on healing! (Except, of course, for the Bible!) Every born again Christian must read this book. It is one of the greatest books ever written!